In light of so many U.S. seniors’ limited use of digital technologies, we decided to look into the kinds of digital resources and services that U.S. public libraries offer and to study how public libraries aid seniors in learning how to use new technologies. We created an online survey to learn about librarians’ perspectives on the technology needs of seniors and the services they are providing. We conducted the survey using the web-based survey platform Qualtrics and recruited respondents through eight library electronic mailing lists. The survey was active between January 16 and February 18, 2013, and yielded sixty-six complete responses. 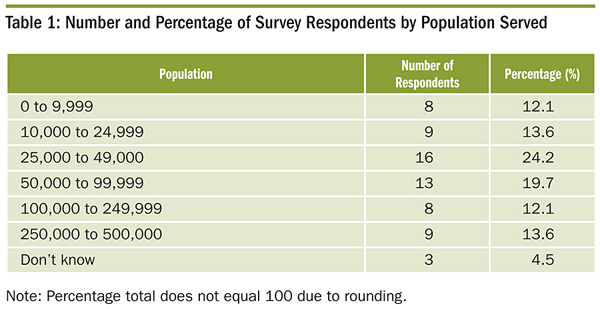 Respondents came from all across North America and served populations which ranged from less than 10,000 to more than 500,000, with the largest number of respondents serving smaller to middle-sized communities (see table 1). The librarians who participated in the survey indicated extensive use of the Internet in their libraries. Ninety-eight percent reported that their libraries have a website, 92 percent said that they have accounts on social-networking sites, and 41 percent indicated that they have reviews from Goodreads or LibraryThing incorporated into their OPACs. While not asked specifically about digital databases, fourteen respondents (21 percent) volunteered that their libraries also offer subscription databases. It is likely that the number of libraries which offer this service is much larger. E-books are also a large part of today’s libraries, as indicated by our survey. Ninety-five percent of respondents indicated that their libraries offer e-books to patrons, and 45 percent also loan e-readers. 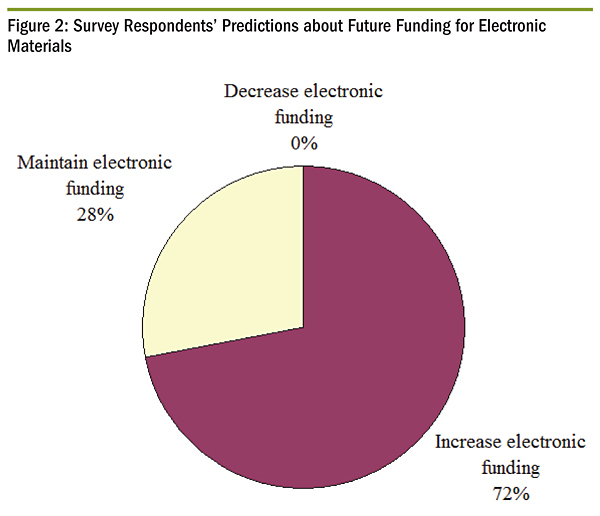 In addition, 72 percent of librarians surveyed expect funding for electronic materials to increase in the near future, and 26 percent expect funding for print materials to decrease (see figures 1-3). 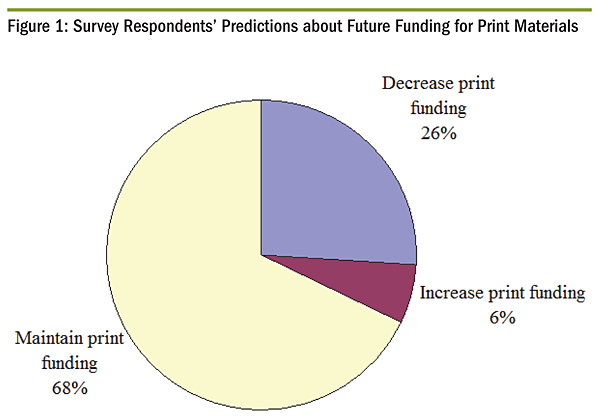 While only 11 percent of respondents predicted a decrease in funding for large print (while 16 percent expected an increase in funding), the ability of e-readers to turn any book into a large print book will expand the selection of available books for seniors and other patrons with vision difficulties if the patrons know how to use the technology. Our survey also asked respondents about their senior patrons’ technology needs, and about the types of formal and informal instruction they provide. Thirty-six (55 percent) of the librarians in our survey indicated that their libraries offer computer classes. Of these, 53 percent offer classes in computer basics, 47 percent offer classes in Internet basics, and 44 percent offer classes in Microsoft Office. Other classes include social media (25 percent), digital photos (8 percent), genealogy (8 percent), and job hunting (11 percent). Only 8 percent of libraries offered classes in using electronic databases. Some libraries offer an extensive range of classes, such as a New Jersey library offering classes in “startup with the Internet, Google Search Tips, Websites for Book Lovers, iPad & Android Apps, Word, Excel, Facebook, Uploading & Editing Photos, email, downloading e-books, and more.” Forty-one percent of libraries surveyed also offer e-reader training, 59 percent of which is conducted via classes. Twenty percent of librarians specifically indicated that money was a barrier to offering technology training for patrons. With more money in the budget, librarians would be able to hire more staff, train staff on technologies, and invest in more computers and spaces to use for training sessions. One funding source libraries might consider is grants. The Foundation Center offers a Foundation Directory Online (http://fconline.foundationcenter.org) which allows users to search for foundations which fund in particular areas, such as technology or libraries. While this is a subscription database, it can also be used for free at Cooperating Collections locations across the country (http://foundationcenter.org/fin). In addition to grants, libraries can take advantage of local resources to assist in technology training. Several of the libraries surveyed indicated the use of volunteers as teachers in their technology classes, and this can be an excellent way to supplement staff instructors. Libraries can partner with local schools and colleges to set up a community service program. While volunteers will need to be trained in teaching methods, often these younger individuals will already have a foundation in how to use technologies and libraries can take advantage of this knowledge. Additionally, libraries can consider fundraising drives to support the purchase of additional technologies to use for training purposes. 1. Small class sizes. In a study done with patrons at two Australian libraries, researchers found that adult library users prefer learning about technology in small classes with a maximum of six students per class and a face-to-face teacher.13 Small class sizes offer teachers the opportunity to pay individual attention to each learner, which can alleviate the seniors’ anxieties about doing something wrong. 2. Guidelines and tip sheets.14 Providing written guides for seniors to take home helps them remember what to do, which helps alleviate the fear of forgetting what they’ve learned in class. 3. Post-instruction contacts. Once the class is over, senior library users would like to see individualized help for specific problems that they encounter and additional self-help aids made available, now that they know enough to be able to follow them.15 Having someone to contact with problems after the class is over helps the learners figure out what to do when layouts change and things they used to understand disappear. 4. Hands-on training. It is also important that classes take place in a space where seniors can interact with the technology they are learning to use. Research shows that people retain what they learn better when they are engaged with their learning—or in other words, “doing something” rather than passively listening to someone lecture or viewing a PowerPoint.16 Being able to use the tools during instruction is especially important when working with technology. We should note that the current research focuses on teaching computer skills, not other technological skills. Cassell, Bamdas, and Bryan also suggest e-book clinics facilitated by library staff which use both visual and hands-on demonstrations to teach patrons how to download e-books and use the library software on their devices, but they do not describe them further.21 While we lack e-reader–specific research, many of the strategies discussed here can also be used for teaching seniors about how to use e-books and e-readers and help move seniors more smoothly into the digital world. 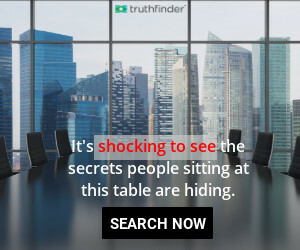 United States Census Bureau, “ACS Demographic and Housing Estimates: 2011 American Community Survey 1-Year Estimates,” American FactFinder, accessed Apr. 17, 2013. Ruth Abbey and Sarah Hyde, “No Country for Older People? Age and the Digital Divide,” Journal of Information, Communication & Ethics in Society 7, no. 4 (2009): 226. Kathryn Zickuhr and Mary Madden, “Older Adults and Internet Use,” Pew Internet & American Life Project (June 2012), accessed Apr. 17, 2013. Phil Turner, Susan Turner, and Guy Van De Walle, “How Older People Account for Their Experiences with Interactive Technology,” Behaviour & Information Technology 26, no. 4 (2007): 291-93. Dale Gietzelt, “Computer and Internet Use Among a Group of Sydney Seniors: a Pilot Study,” Australian Academic & Research Libraries 32, no. 2 (2001): 142. Emy Nelson Decker, “Baby Boomers and the United States Public Library System,” Library Hi Tech 28, no. 4 (2010): 614. Abbey and Hyde, “No Country for Older People?” 233. Joan Ruthven, “Training Needs and Preferences of Adult Public Library Clients in the Use of Online Resources,” The Australian Library Journal 59, no. 3 (2010): 113. Decker,”Baby Boomers and the United States Public Library System,” 612. Mary A. Cassell, Jo Ann M. Bamdas, and Valerie C. Bryan, “ReVisioning the Public Library as an Oasis of Learning,” International Journal of Adult Vocational Education and Technology 3, no. 2 (2012): 13. Turner, Turner and Van De Walle, “How Older People Account for Their Experiences with Interactive Technology,” 295. 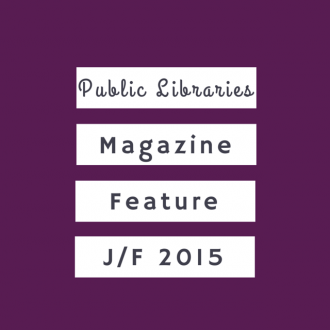 Cassell, Bamdas, and Bryan, “ReVisioning the Public Library as an Oasis of Learning,” 19.